The number one reason people fail to pocket balls consistently is body movement during the shot. They start getting up right as they are about to strike the cue ball. Think of it in terms of pointing a rifle at a target. If you start moving as you pull the trigger, you'll miss the target. And the same thing happens when you jump up on your shot. The sad thing is that most people don't know that they're doing it, and instead blame the miss on their aiming point. The next time they encounter that same shot, they look for a new aiming point, and they miss the shot even worse. I introduce my students to the "Stay-Down Drill." 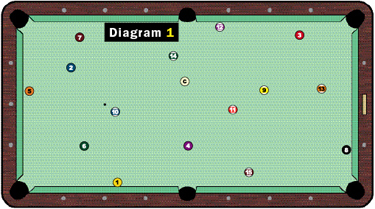 Throw 15 balls out on the table in any configuration (see Diagram 1). The challenge is to sink all 15 balls without moving after your stroke until the cue ball comes to a stop. You essentially freeze on the follow-through. Ask a friend or your coach to watch you - you could even set up a video camera in a pinch - and have them make a buzzing sound whenever you move before the cue ball stops. If you move, you have to start over. You can give yourself ball in hand for each shot. The only restriction is that you can't take a straight-in shot. The cue ball won't travel enough to make the exercise meaningful. We're trying to train your body to stay down for extended periods of time. It needs to become second-nature, because almost all players will move involuntarily in high-pressure situations. Whenever we're anxious or face a difficult shot - a long shot, a power shot, a slow-roller, or a game-winner - our physical fundamentals usually go out the window. Sometimes we get too concerned with the result of the shot, and we pop up to check the result even before we finish the stroke. I wouldn't do this drill in a match. They'll think you're slow-playing. Just practice three or four racks per day. That's all you should need.